HOME > SPORTS > WWE Rumors: Samoa Joe to face Seth Rollins on behalf of Triple H at Fastlane? 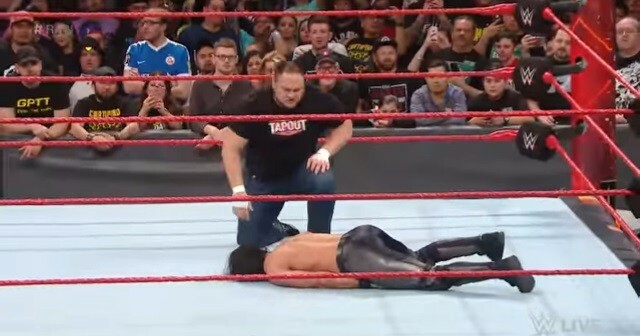 WWE Rumors: Samoa Joe to face Seth Rollins on behalf of Triple H at Fastlane? When the 30th entrant was revealed to be Roman Reigns, fans revolted as they were expecting Joe or even Finn Balor. Nevertheless, the WWE got back to the fans by having "The Samoan Submission Machine" debut on Raw. As recapped by WWE.com, Triple H returned to WWE television to answer the challenge of Rollins. As "The Architect" is heading to the ring, Joe came out of nowhere and viciously attacked Rollins on behalf of Triple H.
Joe brutally attacked Rollins on the outside, tossing him into the barricade multiple times. Rollins tried fighting back but Joe got the better of the exchange. He put the former WWE champion to sleep using his Coquina Clutch to end Raw. According to Cageside Seats, Joe is now an official part of the Raw roster moving forward. He will surely be introduced next week as Triple H's hired gun to take out Rollins. All signs point to the two former NXT champions to clash at Fastlane on March 5. However, the only problem with that booking is Joe could end up being just a pawn on the Rollins-Triple H feud. Joe might lose to Rollins to set up Rollins vs. Triple H at WrestleMania 33 but there is also a chance where Triple H does not wrestle at all. The WWE can go in a lot of direction in the feud with the addition of Joe. Monday Night Raw will also benefit from the debut of the two-time NXT champion. The red brand has been stale because they only focus on four main event stars. Rollins, Reigns, Kevin Owens and Chris Jericho have been the four main superstars and they are always featured week in and week out. Joe adds star power to the fray moving forward. The only hope by fans is that he gets booked better and as a wrecking machine. Check out the video below to watch Joe attack Rollins in front of Triple H this week on Raw.